Theoretically, I write for a living. Yet, somehow, much time gets filled with stuff that is not writing. Emails, phone calls, administration, logistics. Like little birds in the nest demanding worms, these things keep demanding attention (to say nothing of my actual offspring, and the attention required there). If it’s sometimes challenging for me, as a writer, to find time for sustained writing, it’s no doubt more difficult for people with non-writing day jobs. And yet so many people have stories inside them that they’d like to tell. I find the idea of ushering others into a world created solely by your prose — by the arrangement of 26 letters, a few other characters and spaces — to be magical. Such creation is worth making time for. I first learned about National Novel Writing Month (NaNoWriMo) many years ago, and was immediately drawn to the concept. Participants commit to writing a 50,000 word novel in the month of November. If you write daily, that’s about 1667 words per day. If you skip weekends and Thanksgiving, you’ve got 21 days to work with, requiring 2381 words per day. It’s a high level of sustained output, though it’s not ridiculously high. Try counting the number of words you type in emails per day sometime and see what I mean. For someone with the muscle memory of writing, 50,000 words could take about 60 hours. For someone without, it might take more, but there are 721 hours in November (30 x 24 + 1 for the daylight savings time change). At least theoretically, the time is there. Writing 50,000 words won’t take all one’s time. Indeed, if the average person watches about 85 hours of TV in the course of a month (using ATUS data; TV as a primary activity) this suggests a place to find the time right there. A high sustained level of output is doable for one month. Then life can go back to normal, but you have a draft of your novel, which you can then make better. It is so much easier to turn something into something better than to turn nothing into something. For me, the appeal of NaNoWriMo is giving me permission to put writing first for the month. I know I don’t really need permission — I work for myself! — but it’s helpful to know other people are hacking away at their stories too. In any case, I’m aiming to finish a draft of the novel I’m working on now by the end of November. I’m bending the rules — I already started, and am 15,000 words in now — but so it goes. In my mind, I like the idea of November always being a novel writing month for me. I look forward to it. As the leaves change and the weather turns cold, I find myself in a fiction writing mood. I pour myself a big cup of coffee and write, write, write. Will you be joining me this November? What kind of story will you be writing? 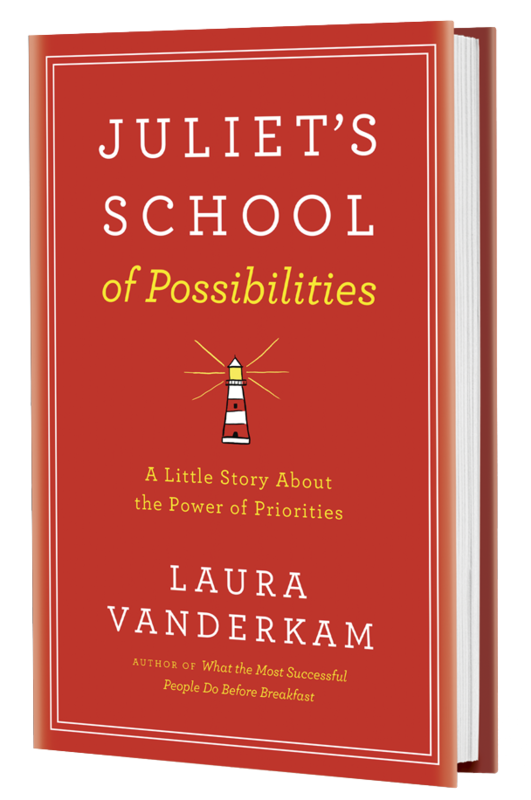 Fun fact: Juliet’s School of Possibilities, my time management novella, began its life as a NaNoWriMo novel. It will be published by Penguin Random House on March 12, 2019. I love this! In my own fledgling side business, I’m working on ways to make enough money writing that I can pay someone to do all the admin/social media/graphics etc. I’m no good at that. But I can crank out 2k words a day like a champ. I figure if I can put writing first by design, that’s most efficient and valuable (I’m an economist by training so this is how I think)! And now I want to know what you’re going to be writing. Do you already have the outline in mind? I’ve been aware of NaNoWriMo for ages and even started a couple times back in college, but never finished. I’ve had the kernel of an idea for a novel sloshing around in the back of my head for a few years now, and writing a book of some sort is definitely one of my long-term goals (it’s on my list of 100 dreams! haha), but NaNoWriMo just isn’t going to happen this year with both a six-month-old and a new job. Next year! I love the concept, but have a very hard time with the commitment and pressure. I am about 6000 words into the first draft of my second novel, and wrapping up the last round of revisions on my first before sending it out to query, but I’ve set the end of the year as my goal. What I find most wonderful about Nano is the creation of a daily writing habit, and the discovery that you can make time – your writing is so great for that. Plenty of novelists have full lives (not busy 🙂 ) with day jobs and other commitments, and all the ones I’ve talked to for my podcast say their writing lives are richer for it! I have a question about the advice to give up time on social media or TV to do novel writing. To me, writing a novel and consuming social media are very different energy level activities, so I don’t really feel like they are interchangeable timewise. I don’t watch TV, but my understanding is that people also do this at the end of the day when they’re tired, which is when I usually consume social media. I can read a book instead of consuming social media, but can’t really see myself writing at that time. The same thing goes for other times I use social media/read (while eating for example, I can read but not write). So, how do you switch out these activities timewise if they require different energy levels or physical setups? As for social media breaks, the little 3 minute checks are hard to repurpose. But I definitely see on time logs longer social media breaks during, say, what could be lunch. Taking a real break and writing might be possible. Since I work in a job where I can’t always put writing first but have completed NaNo several times, I thought it might be helpful to hear some concrete examples. For me, one of the best ways to get writing in during the day is to have a quick lunch at my desk and spend the next 20-30 minutes writing. You say you can’t write while you eat, and that’s true to a degree – but I spend a decent amount of time thinking about what I’m going to say next or reading over my outline to remember the details I need to be incorporating, and that’s something you absolutely can do, especially since you say you read while you eat already. Just avoid greasy foods; your keyboard will thank you. For writing at night, I’ve surprised myself quite a bit with how much I re-energize. (I’m not a big TV watcher, but I do frequently get caught in mindless internet browsing at that time.) It’s not uncommon for me to pull up my manuscript, glance at where I am and write ten words, and then get lost in Pinterest for 20 minutes. But once it’s open, I usually end up coming back and finding a second wind – and I am NOT a night owl. This might be something to try when you aren’t trying to complete NaNo so you aren’t working with the pressure of NEEDING to get those 1667 words in. Then again, it’s NaNo. When else is it acceptable to write “She was very, incredibly, utterly, absolutely, impossibly tired” for the sheer purpose of adding 4 extra words? Don’t worry about creating the perfect novel. You will be tired. I once wrote the exact same scene twice, back to back, because I was in college and too exhausted to remember where I was in the story. As a side note, I’m about 40k words into my current manuscript and hoping to complete the remaining 30k or so by Thanksgiving. Not sure if I can say I’m actually doing NaNo, but I’ll be happy to be done either way! I absolutely do not have a novel in me! But last year I used the NaNoWriMo concept to commit to spending half an hour a day during November sorting out my home and work offices which had both accumulated huge amounts of paperwork etc over years without moving from either. The fact it was only a month and only half an hour really made it work for me, although I didn’t get everything done so am tackling again this year on the same basis. There must be plenty of other things that the NaNoWriMo concept would work for, other than writing a novel, for us less creative types. Just saw this and after telling myself I did not want to do NaNoWrimo I caved in and registered. My reasons for not wanting to were: I’m already 18000 words into a novel and I’m writing it slowly, as it’s a new genre for me (scifi). I’ve just had a very hectic October traveling and organizing a conference, and decided that November was going to be all about resting, crafts and focusing on research writing. But I guess I can’t resist the urge of a new challenge at the beginning of the month! And I’ll be cheating too, so it’s only 1120 words per day!